The formation of Cotswold Archaeological Trust (CAT) in 1989 was a bold and far sighted decision, but one which built on the achievements of the Cirencester Excavation Committee over the preceding thirty years. The plan was that CEC would see through its existing commitments to produce reports on its excavations while the new entity, a registered charity, would take responsibility for all further fieldwork.The creation of CAT was directly linked to the changing state of British archaeology, and in particular the principle that developers should pay for archaeological work (which became formally enshrined in government planning policy the following year). From humble beginnings Cotswold Archaeology (as CAT was re-branded in 2002) has now grown to become one of the UK’s top four archaeological contracting organisations employing over 100 professional archaeologists at offices in Cirencester, Andover and Milton Keynes. A notable event occurred on 15 October 2008 when we celebrated the fiftieth anniversary of the foundation of CEC with a lecture and reception. This was an opportunity to welcome back to Cirencester many people who had worked there over the preceding five decades. 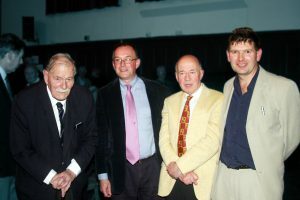 The photo shows (from the left) Professor Sheppard Frere, Chairman of CEC 1965-1989; Professor Timothy Darvill, a founder trustee of Cotswold Archaeology and its Chairman for the last 22 years; Alan McWhirr, Director of Excavations for CEC 1965-1989 and trustee of Cotswold Archaeology 1989-1997 and Neil Holbrook, Chief Executive of Cotswold Archaeology since 1991.